Description: Pride and Prejudice, Sense and Sensibility, Emma...these titles conjure up a romantic world of rolling English countrysides, elegant balls, noble gentlemen, and headstrong gentlemen's daughters. But how much do we know about the woman who immortalized those times and names like Mr. Darcy and Miss Elizabeth Bennett? Growing up in a clergyman's home gave Jane Austen opportunities to watch human nature at its best--and worst. Drawing from historical sources as well as her own keen imagination, Christy Award-winner Nancy Moser transports readers inside the life and times of the literary world's most beloved heroine. Known for her moving and unique Mozart's Sister, Nancy Moser brings to life the mind and wit of Jane Austen--the loves, disappointments, and victories that shaped the novels that have remained popular for nearly two hundred years. I avoid most fiction about Jane Austen, either in movie or in book form. Why? I just haven’t liked their take on this historical character. We really don’t know that much about her, which leaves lots of room for speculation and embellishment. It is rare for me that a main character in a book is my favorite. I usually like the side characters more. However, Jane tugged at my heart strings. She has to go places and be with people she doesn’t like. She doesn’t always have a good attitude. In other words, she is real, human and a lot like me. In fact, all the characters felt real. The relationship between Jane and her sister was my second favorite part of the book. It reminded me so much of my own friendship with my sister. Thank goodness Nancy Moser didn’t listen to all those people who say sisters can’t be that close. She portrayed a real friendship, one that has its ups and downs, but is always close. My favorite part was Jane as an author. Nancy Moser captured how authors feel so well in this book. I really identified with Jane’s struggles and challenges in writing. Many of my author friends will love this book just to hear Jane complain that her characters aren’t talking to her (it’s a writer thing). 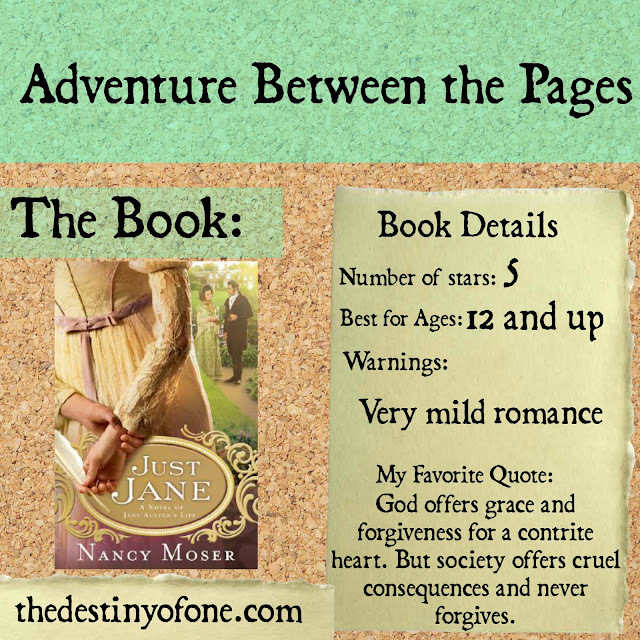 The story itself was like a Jane Austen book; not full of heart-stopping romance, adventure, or suspense. Instead, this story relies on you being involved with the characters enough to want to know what happens to them next. 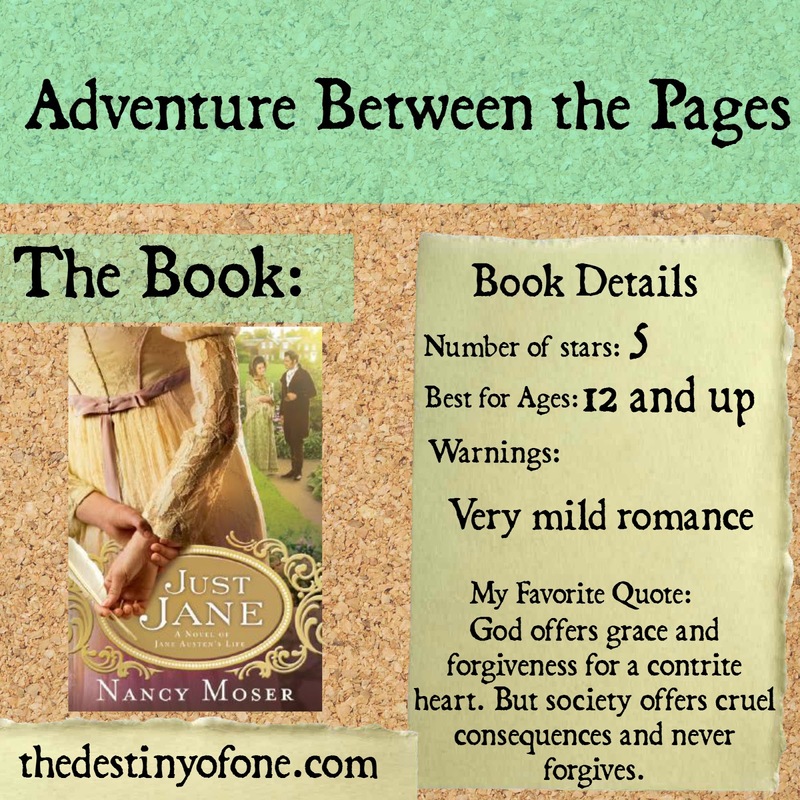 I highly recommend this to those who like Jane Austen, non-romance fiction, and strong, character-based stories. Wow, Sarah! That was a really amazing review. I have been wanting to read this book for a while, your post has inspired me to read it sooner. :) God bless! I was so impressed by this book. I had not expected it to be so good. I hope you enjoy the story. Sarah, have you read Nancy Moser's other books about historical women? They are all amazing: Mozart's Sister, Washington's Lady, and How Do I Love Thee? These are some of my favorite books by a contemporary author!